As is my habit, here’s a review of what’s hot and exciting in Halifax (see also 2006, 2008, 2010, 2012, and 2013). We has an excellent sashimi lunch today, inventively prepared, at Alex Oh Sushi & Rolls, just up the street from Pete’s Frootique on Dresden Row. It’s hard to describe the presentation, but it involved twigs. Recommended. After finding a depressing selection of eyeglasses frames in Charlottetown — it proved almost impossible to find anything that wasn’t rectangular and brown — I followed the recommendation of my friend BJ and dropped in to Gaudet Optical on Quinpool Road this morning. Personable optician Chris Ross was my guide through their dizzying selection of frames — “from functional to outrageous” is their tagline — and he helped me winnow things down to two pairs, one to house my everyday bifocals and a second pair for computer use. I ended up spending more than twice what I would have paid in Charlottetown, but I’m very pleased with the results, which should be posted to Charlottetown next week. 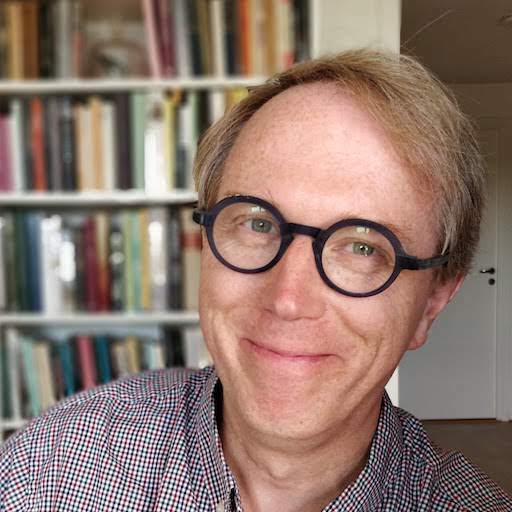 I was guided in my selection by the eyeglasses worn by actor Alex Jennings in The Lady in the Van. And, according to my friend Dave, by Costas Halavrezos. So rectangular and brown are out and round and blue are in. I’ll either be the most fashionable man in Charlottetown, or a cartoon-like laughingstock. Stay tuned. The ferry to Dartmouth continues to be one of my favourite activities in the city. For $2.50 you get a 15 minute trip across the harbour and, if you’re lucky like we were, you get to witness shipping traffic up close. On the other side is an outpost of The Wooden Monkey and the original Two If By Sea, so you can eat and drink before heading back. The basil rice we had on Sunday night at Thai Ivory Cuisine on Quinpool Road was almost as good as I remember having in Thailand. Inkwell is celebrating 5 years in business soon. Who would have thought a shop selling letterpress-printed creations would last? But it did. And that’s a good thing. All credit to Andrea Rahal for her perseverance, especially amidst the chaos in the neighbourhood while the behemoth Nova Centre goes up across the street. Last summer Upstreet in Charlottetown had a party for the neighbourhood and it featured a pop-up barbershop operated by Sailor Bup’s from Halifax. Oliver got his sharpest haircut every that day, and so we made sure to book him in for a cut on this visit. We were not disappointed: Cory Murphy gave him an excellent cut on Tuesday afternoon and he’s looking as sharp as ever. I hadn’t been in Point Pleasant Park for more than 20 years, but Ethan wasn’t getting the exercise he needs so we resolved to fix that with an afternoon hike in the sun today. I had no idea what wonders awaited us: there are great gobs of history around every corner in the park, and every significant feature is sign-posted with a QR code that leads to a SoundCloud-hosted audio commentary. Ethan got a long walk and we learned more about batteries (the military kind) than I thought possible. We’ve been staying at the Best Western Chocolate Lake, a hotel I’d never heard of until it showed up as an option for using my Airmiles. To picture where it is, imagine that you’re coming into the city from the airport, and you turn too early at the Armdale Rotary, heading up the hill to the right rather than around the bend to Quinpool Road: the hotel is about 3 minutes up that road. The hotel goes to great pains to advertise its dog-friendliness (to the extent that Cocoa, the house dog, lives in the lobby); this turned out to be a mixed blessing for us: Ethan was, indeed, welcome. But so were a lot of other dogs, which meant for more-than-usual stress during morning and evening pees in the back yard, and an incident with a yappy dog in a neighbouring room barking incessantly when it smelled Ethan. 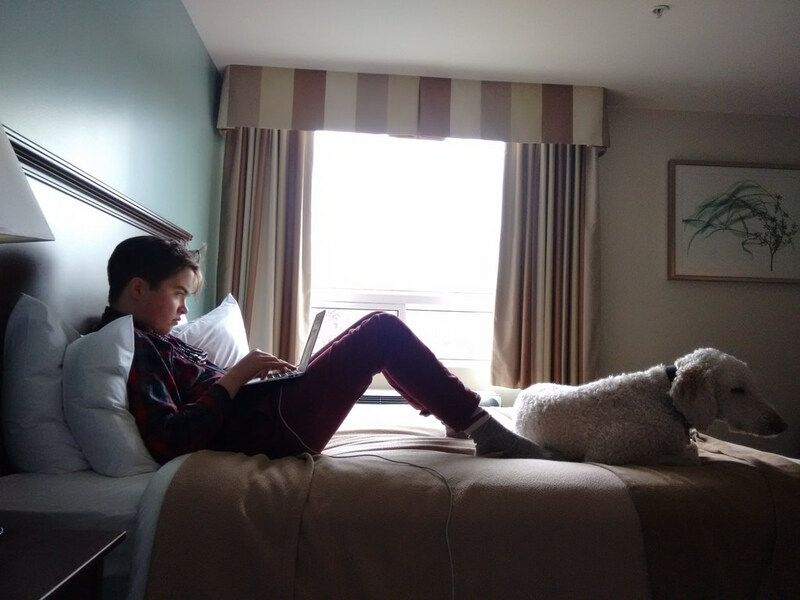 All things considered, I think we do better when Ethan’s the only dog in a hotel. Our wing of the hotel, the low-rise one along the side, is rather tired-looking: the rooms are clean and bright, but nothing to write home about. Otherwise, though: the location can’t be beat, it’s minutes to anywhere in town; there’s plenty of free parking (always a $20/night ding at the downtown hotels); the wifi is included and is reliable and fast; and there’s a serviceable breakfast buffet included. And, even with the competing dogs, having a patch of grass along the lakeside was nice. The Dutch Licorice tea at Humani-T on South Park Street (just around the corner from Spring Garden Road in the same building as Plovers) was just what we needed after a day of around-and-about. So much so that we stopped by twice this week. We also had supper at their second location, near the Hydrostone; while the downtown location is airy and welcoming, we found the North End one cramped and tatty. But that licorice tea (only available downtown), man that was great. We’re off back again home tomorrow; it’s been an enjoyable four days here in the big city. Written March 23, 2016 at 10:53 p.m.
Love Chocolate Lake Best Western. If you ask for the 2 queen-bed rooms they are in the high- rise portion and look out on the lake. Gorgeous. The first time we stayed was before Christmas and all the presents under the tree were for Cocoa, the chocolate lab. The Hotel was Not Good for Me because of the fact that the Booking Website did not have a Category for Teens.